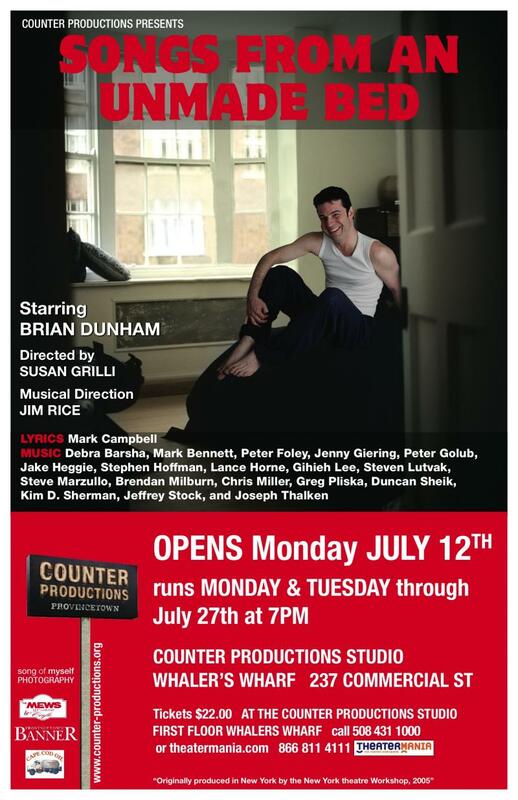 Songs From An Unmade Bed, the song cycle featuring lyrics by Mark Campbell and music by a number of composers, celebrates the small, quiet moments in urban gay life - no coming out stories, no politics, no wringing of hands over the state of things today. It's just the sly smiles after a tryst, a boyfriend's charming but somewhat inept attempts to play the cello, and seeing a lover naked for the first time. Nothing profound and earth-shattering. Just normal, everyday events. Brian Dunham takes on the songs with appropriate enthusiasm. He cuts a pleasant figure, and has a good voice, though he tends to become overly breathy on his high notes. He shows a particular gift for the show's quiet and touching numbers, and is able to create an almost palpable wistfulness during some of the songs. Some numbers which are a little more cynical in nature, or those that have a hint of anger, are not as effective, as he has a tendency to miss the wry, self-deprecating humor that should accompany them. Overall, however, he performs well and keeps the audience engaged. The show is perfectly suited for Counter Productions' intimate studio space on Whaler's Wharf, and director Susan Grilli uses the space to maximum effect. There are a few times when she allows Dunham to wander into shadow, but this is a minor distraction. Music Director Jim Rice and Cellist Elizabeth Schultze perform well, though there are times when Dunham and Rice seem slightly out of sync. These lapses never last particularly long, but they are enough to pull one out of the moment. Despite a few rough patches, Songs From An Unmade Bed provides a pleasant diversion for those seeking theatrical pleasures in Provincetown.